Before announcement of NaMo (Gujarat Chief Minister) as BJP’s Prime Minister Candidate created sensation crazy on Social Media Network having maximum number of followers across the world. Now, after announcement of Prime Minister Candidate for Bharatiya Janata Party (BJP) Narendra Modi (NaMo) created buzz among smartphone users enabled with Android Version having Google Play store to download apps. Recently game created by Dexati which was released on Android Phones through Google Play Store on 28 July, 2013. 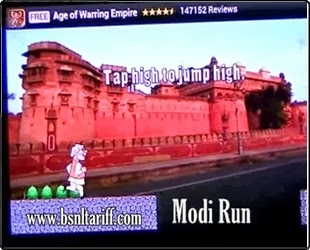 Maximum smartphones buyers and fans are rushing to download and play the game known as ‘Modi Run’. Modi supports are very happy with this game and enjoying it by playing and publicizing with their friends. On Google Play Store ‘Modi Run’ game it’s description reads, “Help Modi through all the states and gather the votes to win the election and become Prime Minster of India (PM). Modi Run is an game where politician Modi runs through all the states and wins over the lection to become PM. Gujarat, Maharashtra, Uttaranchal, Rajastan, Kerala, Karnataka, Andhrapradesh, Bihar, Uttarpradesh, Tamilnadu, Assam, Madhyapradesh. If you’re a fan of Modi don’t delay rush to Download Modi Run game from Google Play Store and Help Modi to win the election by running through all the election.